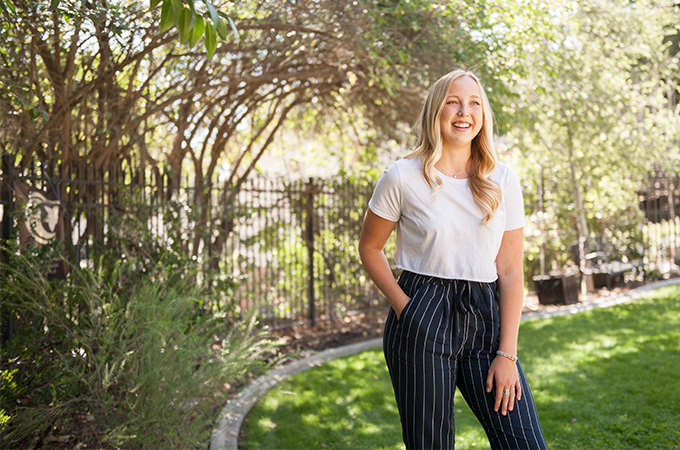 After growing up in the Pacific Northwest, Sadie Pickering ’20 came to the University of Redlands in search of an environmental studies program but ended up finding much more. “I knew I’d be able to be a part of multiple organizations on campus while playing lacrosse, and that’s what drew me to Redlands,” she says. Pickering, who is a student-athlete, a member of Maroon and Grey (a student organization that works with the University’s fundraising and community relations team), and the recruiting chair for the Kappa Pi Zeta sorority, says that the connections she has made with other students on campus have been the best part of her college experience. Pickering’s involvement in Greek life has provided her with valuable life skills for after graduation. “I wanted to hold a leadership position in Kappa Pi Zeta because members practice standing up and talking in front of people and working with people inside and outside of the organization,” she says. Being a student-athlete requires discipline, and Pickering’s efforts are displayed both on and off the field. A double major in environmental studies and management, Pickering has been a Southern California Intercollegiate Athletic Conference player of the week and an Order of Omega outstanding Greek-athlete, selected by the University’s Panhellenic Council. In the classroom, being an environmental studies major has had some unexpected revelations for Pickering. Because she spent much of her childhood playing outdoors and developing sustainable habits, she says her coursework doesn’t even feel like work.